Emera: I know I’ve said in the past that I don’t expect tremendous growth from this company, but it is a very nice holding to have during market volatility as this is where a lot of investors run to (90% of their business is regulated). Further, it recently pulled back 20%, and I can count on one hand how many times this has happened in the last 20 years. I recently picked up more shares of Emera, partially to cost-average the shares I already owned. Linamar: This is a true value play. I have also said this isn’t a must in your portfolio (given their cyclicality), but with their recent acquisition of a large agricultural company (which wasn’t accounted for in their annual results), I am very optimistic about Linamar, given their recent performance and especially at these valuations. The automotive market is softening, but their astute management has ensured consistent profit growth. Logistec: This company is hardly recognized by investors, but they just released some very solid results yesterday. Their revenue is at an all-time high, and although their cash flows are still on par with five years ago, I would not be surprised to see significant growth this year, more than their valuations imply. They just made a very accretive acquisition, modernized their logo, and management is sounding like they’re ready to take this company big. If you’re wanting more of a “blue chip” name, Stantec is also well-positioned for growth. MTY: This is nothing new, but again, for one of the best companies on the market, they are trading at a fairly underappreciated valuation. And compared to their historic valuation, they’re trading at a very low price/cash flow ratio. Update: 6 months later, it seems like I got 1 very right, 1 very wrong and 2 so-so. I haven’t changed my opinion on any, and in fact have stronger conviction in each. Over the last few weeks I’ve been looking for value companies in the Canadian market. On a global scale, the Canadian market has actually done quite terribly (on average), so I’m not too concerned about buying into an expensive market. But valuations aren’t exactly cheap either, especially for some of the best companies that I am invested in. So as Buffet says, I’m looking to buy a dollar bill for 40 cents. But I’m also keeping in mind his other philosophy: I’d rather by a wonderful company for a fair price than a fair company for a wonderful price. Update: Admittedly, I haven’t used it since… screeners, no matter how good, aren’t the best way to find great companies. Globe & Mail also has a stock screener (rather than “filter”). Both are fine, but the one I linked is by far the most useful and accurate screener I’ve used, and is how I came across Morguard Corp. The story behind Morguard is fascinating. In a true rags-to-riches story, Indian immigrant, Rai Sahi, worked his way up from unloading rail cars to eventually acquiring the company I’ll be discussing today, now managing $20B in assets. He has earned his place as one of Canada’s few billionaires, recently placing 59th on Canada’s wealthiest. His entrepreneurial success was coincidentally kicked off in the 80s by one of my favourite companies, CCL Industries, buying a business from him for a significant premium to his cost basis. Since then, Rai has dabbled in numerous industries, mostly turnarounds, each one focusing the company on what it knows best. He carried this philosophy over to real estate, where he buys distressed assets for cheap with the expectation that he can get consistent cash flows over the long term. He’s always talking about rental income per square foot. Morguard owns a diverse array of assets in diverse geographies; everything from Edmonton, to LA, to Florida, to Toronto. Before I get into comparisons, I must clarify that MRC is the parent corporation which has an interest in their Mortguard REIT (MRT.UN), Morguard North American Residential REIT (MRG.UN), and most recently, Temple Hotels (TPH). The difference is that MRC also makes money off of advisory services, much like Brookfield, and they also dabble in other smaller businesses; but real estate is their primary gig. Further, some of their highest quality assets are owned by the corporation, not the REITs. The big benefit is that they don’t have to pay out high dividends (unlike REITs), and therefore can reinvest a lot more into their business for growth. They also get an automatic portion of revenues from each of those subsidiaries. As you can see from their stock chart, their performance has been solid, but I took the effort to compare them to other similar companies, namely: Canadian REIT (REF.UN, which is being acquired soon), Brookfield Asset Management (BAM.A), and Allied Properties REIT (AP.UN). Comparison of real estate companies’ growth over 10 years on a per share basis. As you can see, MRC is in the top, if not the top, of every category. I know for REITs you should technically look at FFO, which is just earnings excluding depreciation and sale contributions, but that was too much work, and since they’re in all in the same industry I consider the comparison fair (we’re also just calculating growth rates anyways, so the numbers should be very similar). As a refresher, book value is the amount you can expect in return if management were to liquidate all their assets and pay back all their debt; it is sometimes estimated as equity per share. So in essence, as seen by their PBV, an investor is buying a dollar bill for ~60 cents (not quite 40, but I tried). And obviously Rai thinks so too as both he and the company are consistently buying back shares; Rai now owns ~57% of the company. One thing that an analyst pointed out is their higher debt levels. While their debt/equity has been about 1.7x in recent years (more than REF & AP, but less than BAM), I’m not too concerned. First of all, they’re making efforts to capitalize on the weakened Alberta market. Secondly, Rai makes it a priority to finance over ten years so that only 10% of their debt is due each year. This strategy proved valuable during the Great Recession. And lastly, their interest coverage ratio (EBITDA divided by interest expense) has been above 3.5 in recent years which is more than safe in my opinion (below 2 is usually a bit shaky, but not bad). Another potential factor is that about 20% of their properties are retail, and obviously everyone is scared out of their mind that Amazon is going to kill retail. And hey, I’m not here to argue otherwise, but I think that the majority of retail centers will continue to operate. Perhaps not for retail, sure, but definitely for some purpose that serves their communities. But the fact of the matter is that A) a discount is still a discount, even if not as large as we would hope, B) more and more of their revenue is coming from advisory services (now 14%), which often trades at a much steeper premium, and C) just because they’ve historically traded at lower valuations, doesn’t mean they always will. Especially now, after a decade of sustained growth into a $2 BILLION company. In my opinion, the market is destined to eventually reward them for their success. But if not, most analysts will point out that if the company is ever taken private, they will more than likely be bought out at 1x BV. Which brings me to my last consideration. Rai is now 71, so it’s uncertain how many more years he’ll keep this running. But there is rumor that he will eventually bring the company private. Much of the asset management is done on behalf of the subsidiary REITs, as mentioned. Given my strong belief that Morguard is organized first and foremost for the benefit of the parent company, I also believe the properties held directly by the parent are likely superior investments to the ones held by the subsidiaries. Consider an example. 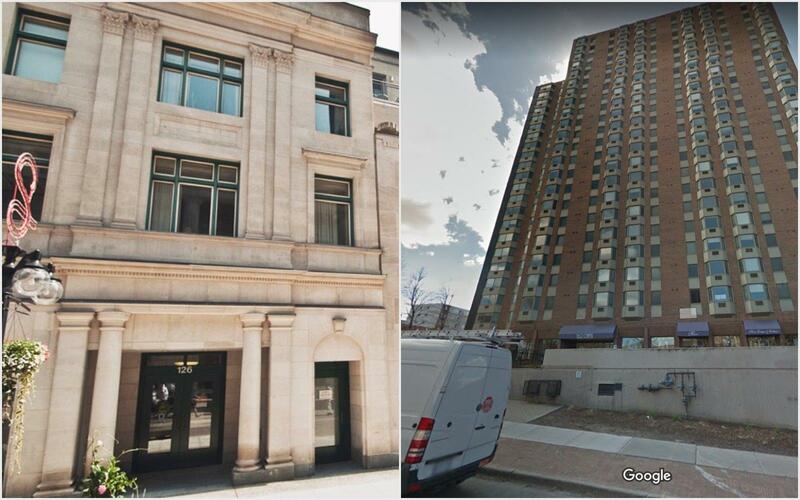 Morguard owns two multi-family real estate assets in Ottawa. One, 126 Sparks, on the left, is located exactly one block from Parliament Hill. The other, 160 Chapel, on the right, is located in a nondescript Ottawa neighbourhood. Sorting through the portfolio, the higher-end properties are consistently the ones directly held by the parent. Why did Morguard create the REIT vehicles? Morguard pays a trivial dividend, but both REITs are income-focused, with current yields of 7.15% and 4.88% relative to the parent’s 0.30%. I view the REITs as ways to monetize lesser members of the real estate portfolio. The market loves yield. 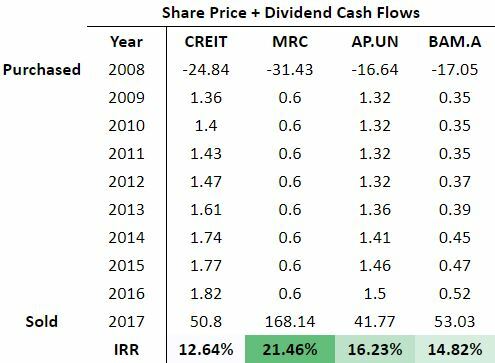 Spinning off the REITs and giving investors those distributions is a way to get higher valuations for non-core assets with less growth potential. Conversely, it’s almost impossible to come up with a reason why Morguard would ever spin its best assets off. In an a hot market, value is always tough to come by, but I believe Morguard offers an opportunity. I also believe that a balanced portfolio consists of both growth and value. Cargojet and Linamar. Shopify and Morguard. I do have my eye on another value play, but I will only email about it once I determine an investible opportunity. Any investor can identify a successful company (though oddly many still invest in terrible ones), but the real discipline comes in identifying successful, low-cost companies. Many low-cost companies have deserved their share price. Update: If I recall correctly, this “value play” was High Liner Foods (HLF), which ultimately I did NOT invest in because I determined it WILL struggle to be a successful company. I will discuss these lessons in depth in my 2018 Annual Review. It also could have been Element Fleet (EFN), which I discussed extensively in my 2017 Annual Review. You should check it out. As I said at the beginning, I wouldn’t expect crazy returns from Morguard, but it does provide safety. This is a concept developed by Graham and promoted by Buffett: the lower cost a company is relative to their book value, the higher the safety. After all, who wouldn’t buy dollar bills for 60 cents? As always, if you have any questions, comments, or otherwise, just shoot me an email and I’ll be happy to discuss. If you want to see more of this thorough analysis, InvestorsFriend is the place to go. I partnered with InvestorsFriend because many of my readers just wanted a professional to suggest EXACTLY what to invest in.